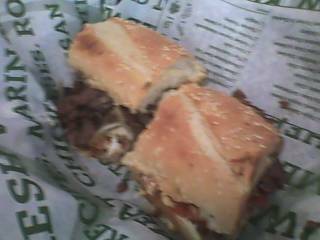 I’ve mentioned my love for Quiznos before, and it continues to grow. Quiznos has an extremely large menu, to the point that I could review just Quiznos sandwiches from now on and still keep my blog running for several months. I won’t do that of course, but the point remains: these guys make a ton of sandwiches. This particular sub is the Bourbon Grille Steak. The sandwich consists of steak, mozzarella and cheddar cheeses, mushrooms, sautéed onions, and most appropriately, Honey Bourbon Mustard, as well as Zesty Grille Sauce. One thing I appreciate about Quiznos is their willingness to combine multiple sauces and spreads for new flavors. The sauces worked well together, as did the cheeses. The steak was tasty as well. However, the veggies* could’ve been prepared a bit better. I didn’t dissect the sandwich to check, but the onions certainly didn’t taste sautéed, so if they were, they could’ve benefitted from a bit more time in the pan. Likewise, the mushrooms would’ve been much better sautéed. A small flaw in an otherwise enjoyable sandwich. Quiznos is also a bit pricey. The sandwiches are a little expensive, but the combos are really where they hit you. I would recommend getting a two for $5 meal; however, that menu is a bit more limited (for example, the Bourbon Grille Steak isn’t available in any of the sizes offered). Quiznos is still my sandwich shop true love, and the Bourbon Grille Steak was quite delicious, but it may not always be the best choice for the budget-conscious. *I know that mushrooms are a fungus, not a vegetable, but it would’ve been clunky to reference that up there.